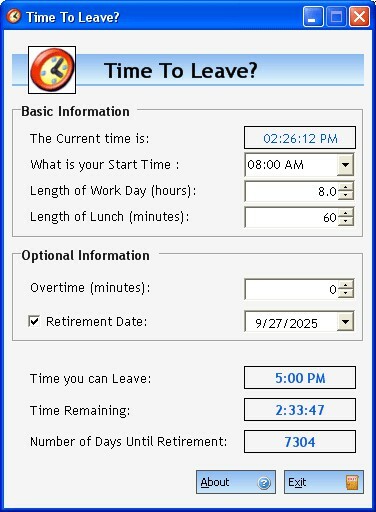 Time to Leave 1.0 is calculators & converters software developed by Ignyte Software. Time to Leave allows you to enter what time you start work, how many hours a day you work, and how long of a lunch you take. The application then calculates what time you can leave work. The screen continuously refreshes how much time you have left in the day, based on the system time from your PC. The settings are saved so that they are automatically restored each time the application is started. This business program is freeware, so you can download and use it absolutely free. Time to Leave 1.0 supports different languages (including English). It works with Windows XP/Vista. We have tested Time to Leave 1.0 for spyware and adware modules. The software is absolutely safe to install. Our website has thoroughly tested business product Time to Leave 1.0, written the review and uploaded installation file (664K) to our fast server. Downloading Time to Leave 1.0 will take several seconds if you use fast ADSL connection. Ever wanted to know how long left exactly until next weekend or how long you have been married? This software is what you need. Time Clock Jr is an employee time clock application, and so much more. Nap Time is a small application that allows you to enter the amount of minutes you would like to elapse before the computer goes to sleep. MonitorZ is a small application to change the time of the monitor before it goes to sleep. Launch Time is another small but useful utility that will automatically launch or open any Finder object after your Mac has been idle for a period of time.